A cowboy runs for safety. It seems my earlier posting about cowboys and cowgirls at the rodeo was my single day most clicked on blog post, so I thought I would revisit it today. Hardly a day goes by that the previous post doesn’t get clicked on! This series of photos illustrates one of the scarier moments of my photography career. I’ve been hit by a line drive softball and come close to being run over by college and high school football players, but this could have been the worst of all except for a rickety metal fence! 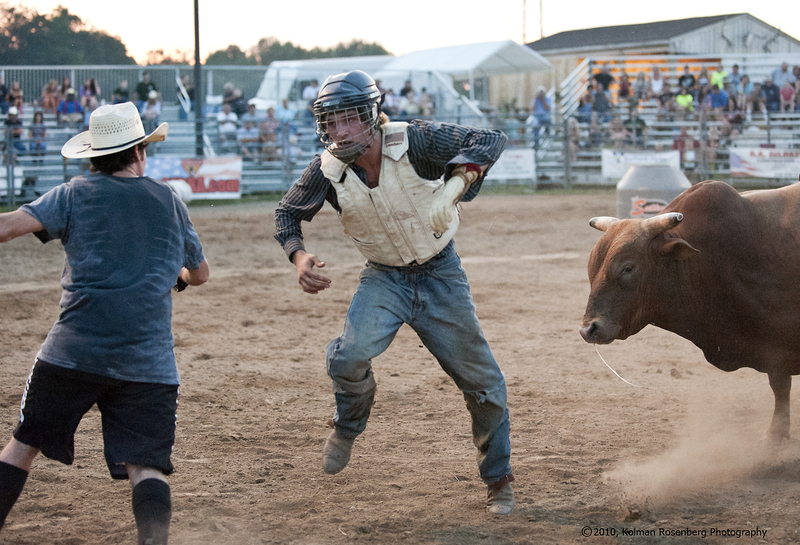 I was shooting the rodeo in Burbank, OH in 2010 and not far in front of me this cowboy had just been bucked off the back of the bull and was heading for safety as another cowboy tried to distract the bull. The bull heads my way! The next thing I knew the bull had set his sites on me, shooting thru the fence! Other photographers quickly retreated but for some reason, probably the fact that I had avoided football players, I stayed put and continued to shoot, having some confidence in the fence. I got off one more shot, out of focus since the bull had gotten closer than my lens could focus, before finally retreating. The bull finally veered off and as I looked down at the ground, his hoof prints were just inches from where my feet had previously been standing. 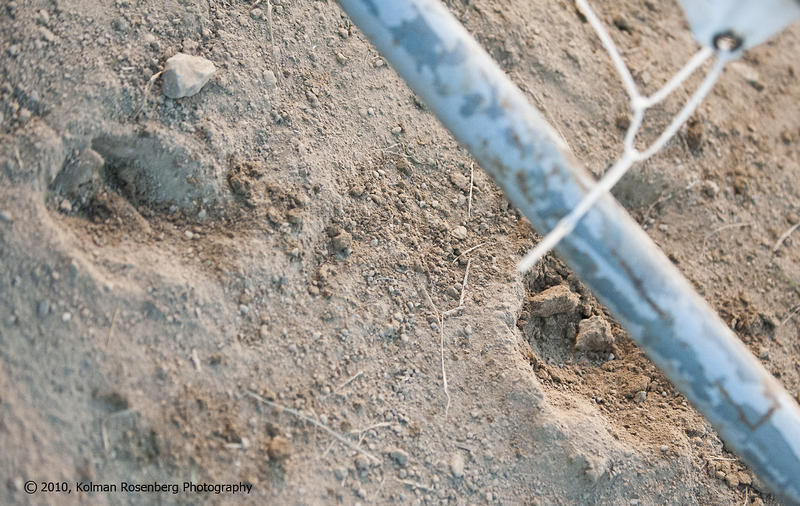 Hoof prints under the fence. I guess that was close enough! I never felt in any danger, maybe foolishly, but I never witnessed any of the bulls actually hitting the fence, so I felt pretty confident. I laugh about it today, but I definitely remember the surge of adrenaline immediately after! 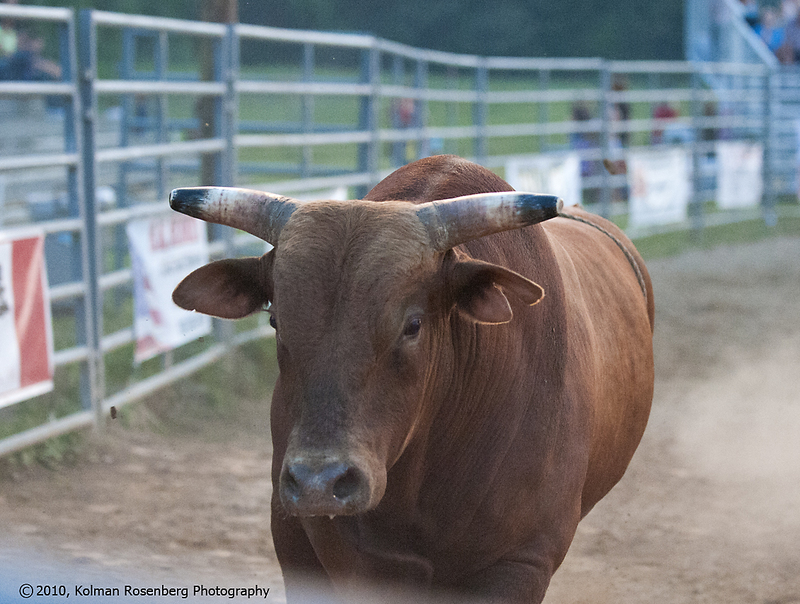 This entry was posted in Uncategorized and tagged Adrenaline, bull, burbank, cowboy, cowgirl, OH, ohio, Photographer, rodeo. Bookmark the permalink.